Short & Stocky with Laid-Back Power & Astonishing Yields! Gorilla has just plonked you firmly in the driver’s seat of the Indica! With nothing but a collection of the finest Indica cannabis seeds, personally selected by the Gorilla from only the best breeders from around the globe, you can’t possibly take a wrong turn. Check 'em out! 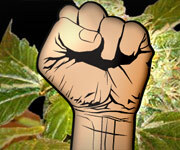 Get Your Violator Kush Seeds Now - You Won't Find'em Cheaper! If you're looking for a true knockout, look no further than DNA's OG LA Affie. This is a real classic with medical-grade power that's truly unbelievable. Astonishingly Fast - As Little as 45 Days! Barney crossed his peppery Stella Blue with the minty Nepali Kush to create the very special Peppermint Kush. High THC and very high CBD make this little Kush a sweetheart. Raging like a jungle beast, Punky Lion is extremely strong & extra massive. THC goes all the way to 18% with yields to match on this near-narcotic Indica. Punky Lion is a premium mix of Matanuska Tundra & classic Chronic that will blow your f*cking mind! Why Choose an Indica over a Sativa Seed? Obviously actually exploring these properties will involve you living somewhere where it is legal to grow you cannabis seeds, but as a collector, at least you know what your seeds are capable of. The Gorilla is a huge fan of indica seeds and always makes sure that your indica seeds will be 100% organic and of the highest quality…or else he’d go mad, and eat a Fiat Panda or something. Get Your Indica Seeds Now!